Peptide (C)KIRKEFPKTQGQYSGFKYPY, corresponding to amino acid residues 576-595 of rat P2X7 receptor (Accession Q64663). Intracellular, C-terminus. Homology Mouse - 18/20 amino acid residues identical; human - 16/20 amino acid residues identical. Label ATTO-550. Maximum absorption 554 nm; maximum fluorescence 576 nm. The fluorescence is excited most efficiently in the 540 - 565 nm range. This label is related to the dye Rhodamine 6G and can be used with filters used to detect Rhodamine. Standard quality control of each lot Western blot analysis (unlabeled antibody, #APR-004), and immunohistochemistry (labeled antibody). Immunohistochemical staining of rat hippocampus frozen section using Anti-P2X7 Receptor Antibody (#APR-004-AO), (1:60). A. P2X7 staining (red) appears in the CA1 pyramidal (Pyr) and stratum radiatum (SR) layers in cells with glial morphology (arrows). B. DAPI is used as the counterstain (blue). C. Merged image of A and B.
Immunohistochemical staining of perfusion-fixed frozen rat spinal cord sections using Anti-VGLUT2 Antibody (#AGC-036), (1:600) and Anti-P2X7 Receptor-ATTO-550 Antibody (#APR-004-AO), (1:100). A. Vesicular Glutamate Transporter 2 labeling followed by goat-anti-rabbit-Alexa-488 (green). B. The same section labeled for P2X7 Receptor (orange). 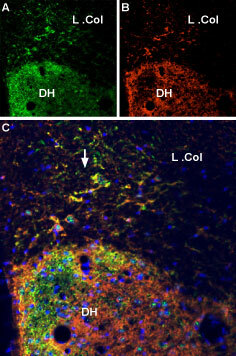 C. Merge of A and B demonstrates partial co-localization of VGLUT2 and P2X7 Receptor in dorsal horn and in lateral column (L. Col., arrow). Cell nuclei were stained with DAPI (blue). 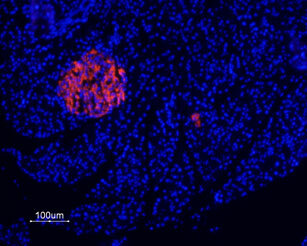 Immunohistochemical staining of rat paraffin embedded endocrine and exocrine pancreas sections using Anti-P2X7 Receptor-ATTO-550 Antibody (#APR-004-AO), (1:20), (red). Staining is highly specific for endocrine cells of the Isle of Langerhans. Hoechst 33342 is used as the counterstain (blue). Mouse spinal cord sections (1:20) (Apolloni, S. et al. (2013) Hum. Mol. Genet. 22, 4102.). Kim, M. et al. (2001) EMBO J. 20, 6347. Chizh, B.A. and Illes, P. (2001) Pharmacol. Rev. 53, 553. The P2X7 purinergic receptor is a member of the ionotropic P2X receptor family that is activated by ATP. To date, this family consists of seven receptor subtypes, named P2X1-P2X7, all of which have been cloned. The various P2X receptors show distinct expression patterns. P2X1-6 receptors have been found in the central and peripheral nervous system, while the P2X7 receptor is found in cells of the immune system, particularly in antigen-presenting cells, and microglia. Expression of P2X7 purinergic receptor in mouse spinal cordImmunohistochemical staining of mouse spinal cord sections (L3–L5) from SOD1-G93A mice were double-immunostained either with anti-Iba-1, NeuN or GFAP (green) and Anti-P2X7 Receptor-ATTO-550 Antibody (#APR-004-AO), (red). 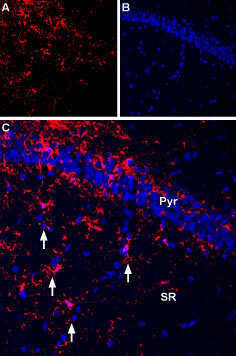 P2X7 is present only in microglia cells as shown in the merged panel (yellow). Scale bar = 20 μm, insets = 50 μm.Adapted from Apolloni, S. et al. (2013) Hum. Mol. Genet. 22, 4102. with permission of Oxford University Press. Anti-P2X7 Receptor Antibody (#APR-004) is a highly specific antibody directed against an epitope of the rat protein. The antibody can be used in western blot, immunoprecipitation, immunocytochemistry, and immunohistochemistry applications. It has been designed to recognize P2X7 purinergic receptor from rat, mouse, and human samples. Anti-P2X7 Receptor-ATTO-550 Antibody (#APR-004-AO) is directly labeled with an ATTO-550 fluorescent dye. ATTO dyes are characterized by strong absorption (high extinction coefficient), high fluorescence quantum yield, and high photo-stability. The ATTO-550 fluorescent label is related to the well known dye Rhodamine 6G and can be used with filters typically used to detect Rhodamine. Anti-P2X7 Receptor-ATTO-550 Antibody has been tested in immunohistochemistry applications and is especially suited for experiments requiring simultaneous labeling of different markers. Kuan, Y.H. et al. (2015) Neurobiol. Dis. 78, 134. Mouse spinal cord sections (1:20). Apolloni, S. et al. (2013) Hum. Mol. Genet. 22, 4102. Anti-P2X7 Receptor Antibody (#APR-004), (for western blot analysis). Anti-P2X7 Receptor (extracellular) Antibody (#APR-008). This antibody recognizes a different epitope and thus can also be used as a control for detecting P2X7. Anti-P2X7 Receptor (extracellular)-ATTO-488 Antibody (#APR-008-AG). A fluorescent primary antibody. It can be used in colocalization studies in conjunction with any of our antibodies raised in rabbit. Anti-P2X7 Receptor (extracellular)-ATTO-633 Antibody (#APR-008-FR). A fluorescent primary antibody. It can be used in colocalization studies in conjunction with any of our antibodies raised in rabbit. Anti-P2X7 Receptor (extracellular)-FITC Antibody (#APR-008-F). This FITC-conjugated antibody can be used to detect P2X7 in live cell flow cytometry. Anti-P2X7 Receptor (extracellular) Antibody (#APR-008). This antibody recognizes an extracellular epitope and can be used to detect P2X7 in live cells. Anti-P2X7 Receptor (extracellular)-ATTO-488 Antibody (#APR-008-AG). This antibody is the conjugated version of #APR-008 and can be used to detect P2X7 in live cells. Anti-P2X7 Receptor (extracellular)-ATTO-633 Antibody (#APR-008-FR). This antibody is the conjugated version of #APR-008 and can be used to detect P2X7 in live cells.